InternationalCupid is probably the most diverse dating website on the internet. It caters to every type of dating, from local to international, interracial and much more. For the purposes of this review, we’ll be focusing on how well it caters to the Filipina dating niche since that is the topic of this website. Since this is such a large website, it does feature Filipinas. There are thousands upon thousands of users from all locations and ethnicities. While the website does feature Filipinas, it can be hard to find them among everyone else on the website. Since this website’s main focus is on being a dating website for everybody internationally, there are lots and lots of diversity present. If you’re open to dating other women in addition to Filipinas, this website can be a great way for you to meet women. But if you’re dead-set on dating a Filipina woman, you might find it takes a bit more time than on a website that only features Filipinas. This website is similar to most other websites in terms of how it is used. You need to create an interesting profile that tells other members more about yourself and features pictures of yourself. Once you have filled in your profile and chosen which pictures you want to add to your account, you can move on to viewing other members’ profiles. Once you find someone you like, you can send them a message and wait for them to respond. From there, it’s up to you and the other person to decide whether you’ll be friends or something more. If they’re close to you, scheduling a real date is a possibility, but since the website intends to connect people around the world, long distance relationships are more likely. A big upside of using InternationalCupid is the costs that are involved. None! Singing up and getting to know the other members can all be done without paying a penny. 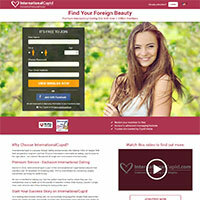 If you’re tired of other dating websites and you want to expand your horizons a bit, give InternationalCupid a try. It won’t be as easy to find Filipinas as on Filipina focused websites, but it does give you the opportunity to meet new and interesting people that you wouldn’t have met otherwise. InternationalCupid is also a great tool to use if you’re planning on moving to a new country and want to make friends there before the big move.